You can track all your SEMRush and Google Analytics traffic metrics in real-time with these 5 dashboards. If you focus on content marketing, you probably expect that at least 50% of your traffic will come from organic sources, based on industry averages. But, growing traffic or figuring out why it’s not growing is not easy. Search engine optimization is often explained through a series of abstract concepts like Google’s PageRank algorithm that have probably exasperated you more than once. You can drive more predictable organic traffic if you’re tracking the right metrics. You need to be able to quickly discover the cause of any changes, good or bad. For example, if traffic is going up, you’ll want to find your top-ranked keywords so you can create more content around those terms. If traffic is going down, make sure your pages are crawlable and find any new, toxic backlinks. You could track all of this by logging into a service like SEMRush every week. But, you probably need to use an analytics service like Google Analytics or Adobe Analytics or even a marketing automation platform like HubSpot to thoroughly monitor your results. And instead of logging in, why not have all your data readily available on mobile, Slack and e-mail? 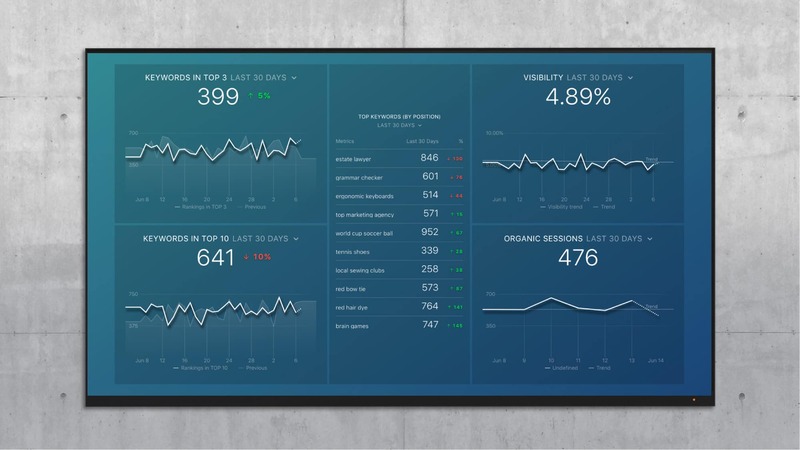 To help, we’ve developed 5 dashboards that marketers can use to track the specific metrics that determine organic traffic. 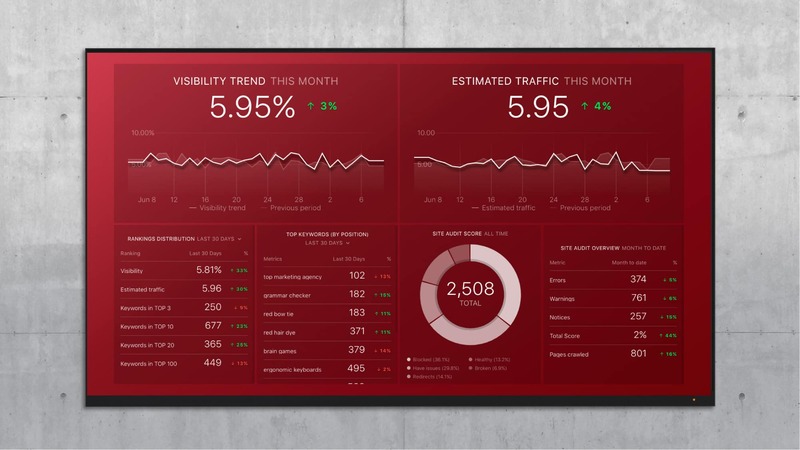 You can use these dashboards on desktop, TV or mobile to measure your hard work. If you need to report results to your boss, teammates or a client, these templates make it easy to show your results. Problem it Solves: There is a steep drop-off in click rates for content that does not rank in the top 10 results for valuable search terms. According to a study from Advanced Web Ranking, 71% of all searches lead to a click on a page one result on Google. Even more dramatically, 55% of searches result in a click on one of the first three results! So, marketers can see a big bump in traffic if they can get a high-traffic keyword from position 11 to position 10. And, they should see exponentially better results as their content gets closer to position 1. SEMRush uses a relative metric called “Visibility %” to summarize all your rankings. Since lower keywords are less visible on search engine result pages (SERPs), SEMRush give you an estimate relative to your specific keywords. The higher your keyword rankings go, the higher the visibility percentage. How To Use it: The left column tracks all top 3 and top 10 keywords related to your domain. This allows you to track your general SEO success since these determine visibility. The middle column looks at the specific terms where you rank highly. If you rank in the top 3 (or number 1) for a well-trafficked term, you should go into SEMRush to see which page is responsible for that high ranking. The last column aligns visibility with organic traffic from Google Analytics. This is the ‘results’ column. When your visibility percentage goes up, you should see a rise in organic traffic as searchers actually click your links. Are your page titles attracting clicks? Problem it Solves: SEMrush created a Site Audit Score to summarize all the different warnings and errors it finds. Although it ranges from 0-100%, there is no specific score that every site should aim for. The more pages you have, the more errors and warnings you will have. If you need a benchmark, use the tool on your competitors and see how you compare! Pages Crawled gives you a baseline for all the pages that the crawler bot can find. Unless you recently took down pages on purpose, you do not want this number to trend downwards! That means errors are piling up. How To Use it: Use this dashboard to communicate your domain’s crawlability as well as any errors you accumulate. Errors are the most severe red flag, followed by warnings then notices. You can use the crawl depth stats to make sure that most pages are three or less clicks away from the root. Those are the easiest to crawl. Are you successfully eliminating toxic backlinks? 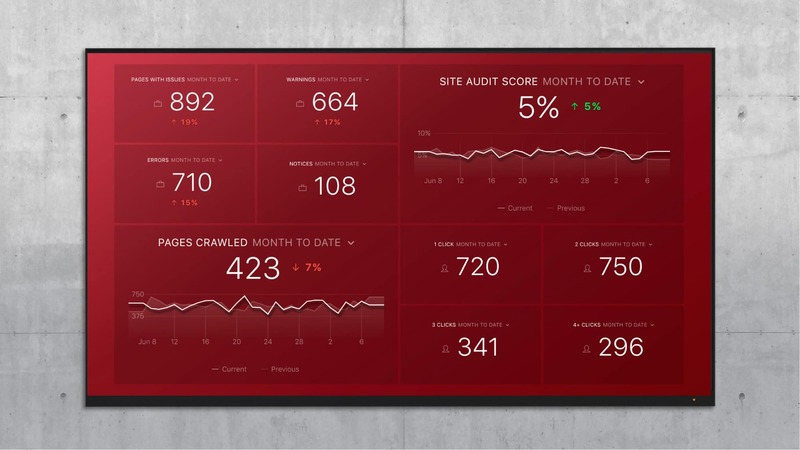 Is your site map easy to crawl? Are you keeping warnings, errors and notices in control as you grow? Problem it Solves: This dashboard examines all the key domain statistics provided by SEMrush. It factors in both positive stats like keyword ranking, and negative stats, like errors that affect your domain authority and crawlability. Estimated traffic is SEMrush’s internal metric that multiplies the volume of searches for each term by the click-through rate of that particular position. How To Use it: Make sure that any hard work on content marketing is supported by a clean, crawlable site. You do not want to put hundreds of hours and thousand of dollars into content marketing simply to be handcuffed by an uncrawlable site. How visible is your domain? What are your top keywords? Are you cleaning up errors, warnings and notices? Does your SEO work increase traffic? Problem it Solves: This dashboard gives an overview of all stats related to keywords. It measures the percentage of your site’s traffic that comes from organic sources in the first place. Then, it covers all your organic traffic initiatives, from keywords to visibility to estimated traffic. How To Use it: This gives a general overview of your success in generating organic traffic. 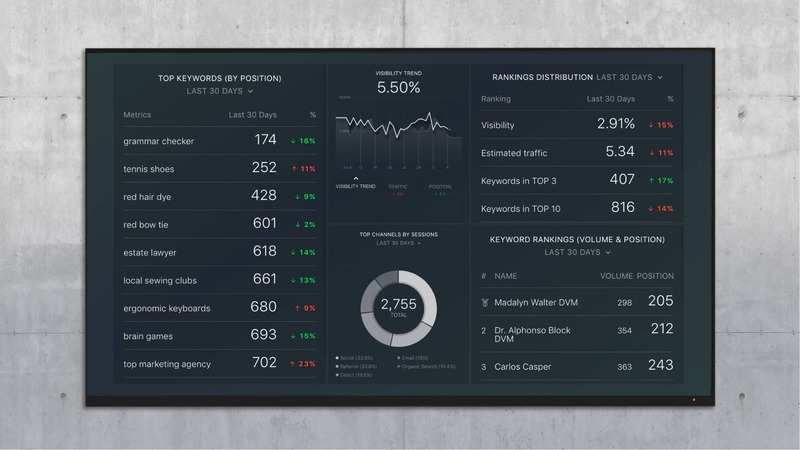 You can use it to align keyword metrics alongside traffic metrics. If you are successfully ranking highly for more keywords, organic traffic should go up. If it does not, you may want to check your Site Audit. How does high-ranking content translate to organic traffic? How well are you competing for specific terms? Problem it Solves: According to our study, 3% of blog posts drive 80% of total blog traffic. And just 0.5% of posts drive 50% of traffic. So, even as your organic traffic builds over many months, you will continue to rely on your top 0.5% of posts. You can use these posts alongside SEMrush’s Content Templates tool to decide where to focus your content production. Or, you can historically optimize these top posts with better CTAs to drive more leads or product sign-ups. How To Use It: The left column ranks your blog posts based on organic traffic, and shows which posts are rising or falling in search rankings based on change in traffic. The middle column clearly shows which posts make up a majority of traffic for the entire blog. In the case above, 3 posts make up 60% of traffic! The right column tracks all organic search traffic and the keywords that drive it. Which posts should undergo historical optimization? Which keywords drive the most traffic? Does your blogging strategy focus on high-performing topics? Set up a daily or weekly scorecard so you get key stats delivered to you on a regular basis. If you would like to find pre-built dashboards for 30+ other digital marketing services, check out our Template Library. Our mission is to make it easy to both monitor and report your key performance indicators to all stakeholders. What data do you monitor and report for SEO?